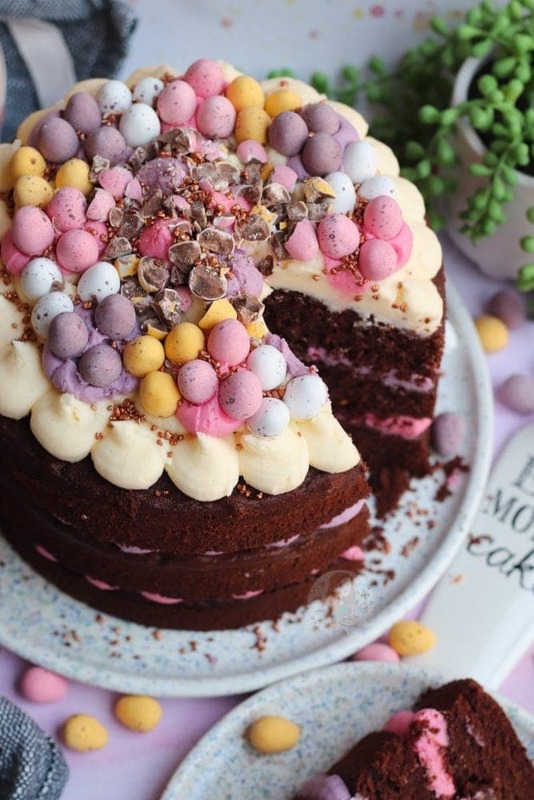 A Three-Layer Mini Egg Chocolate Cake with Pastel Vanilla Buttercream Frosting and Mini Eggs! 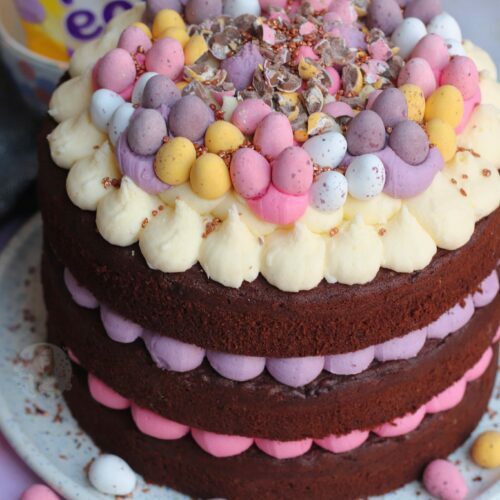 Perfect Easter Showstopper! Oh heyyyyy the most winning Easter Cake ever! 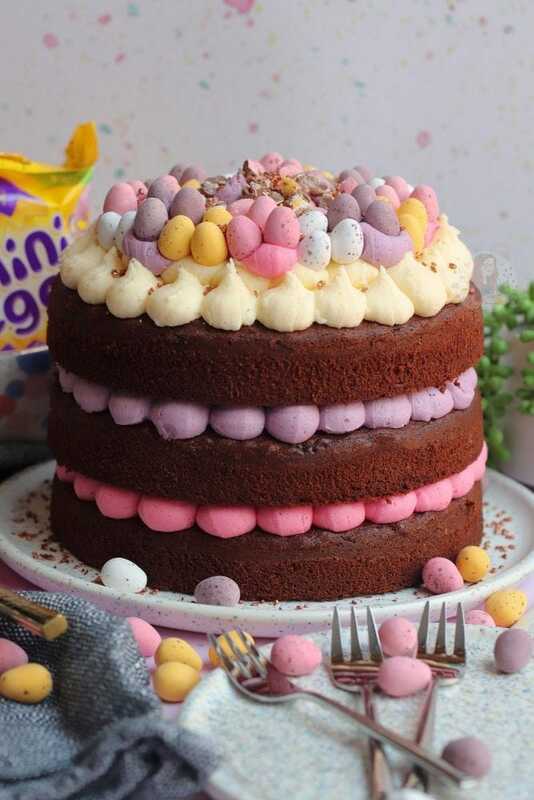 That is a bit of a lie, I love all of my Easter Showstopper cakes equally, and this one even though it is new is already one of my favourites. It just looks so pretty, and tastes wonderful. 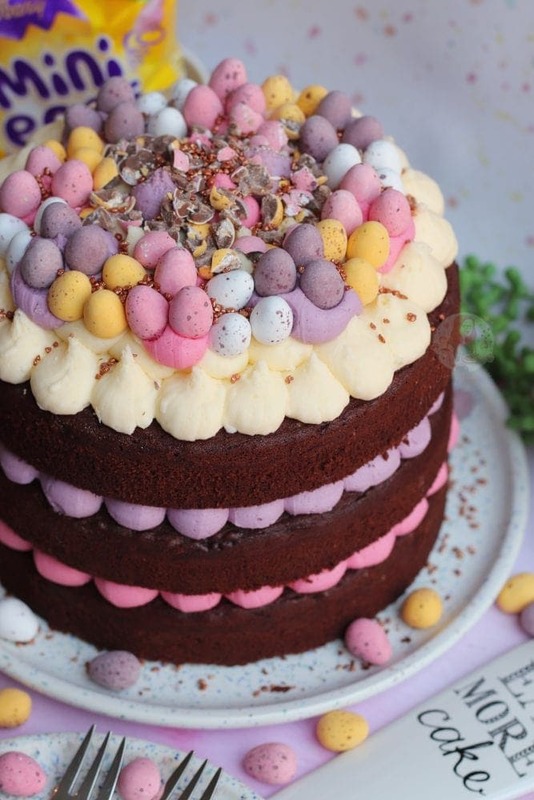 I thought I would post another Easter beauty this year, as I had a craving to do a layer cake with different pastel like colours, and matching the Mini Egg colours seemed ideal! 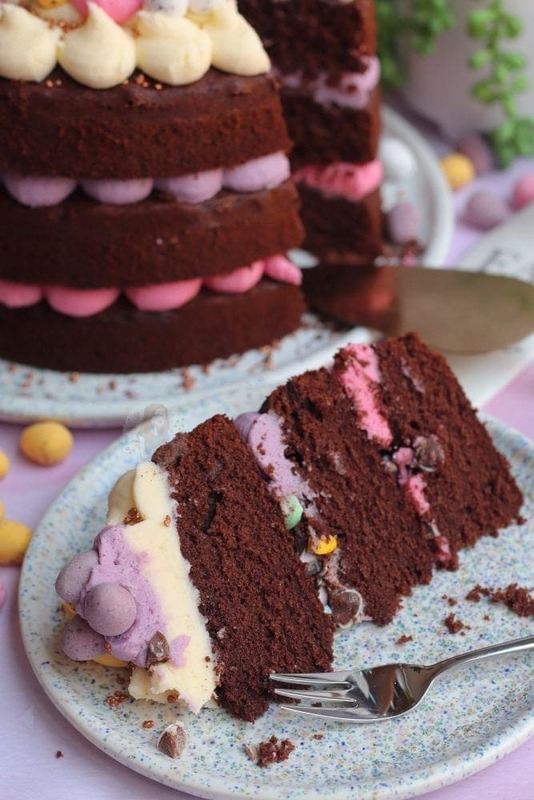 The buttercream colours contrast so nicely with the chocolate sponge, and it ends up looking quite spectacular! Last year I posted my Easter Piñata Cake, and I adore it still. Who doesn’t love a cake full of Chocolate. 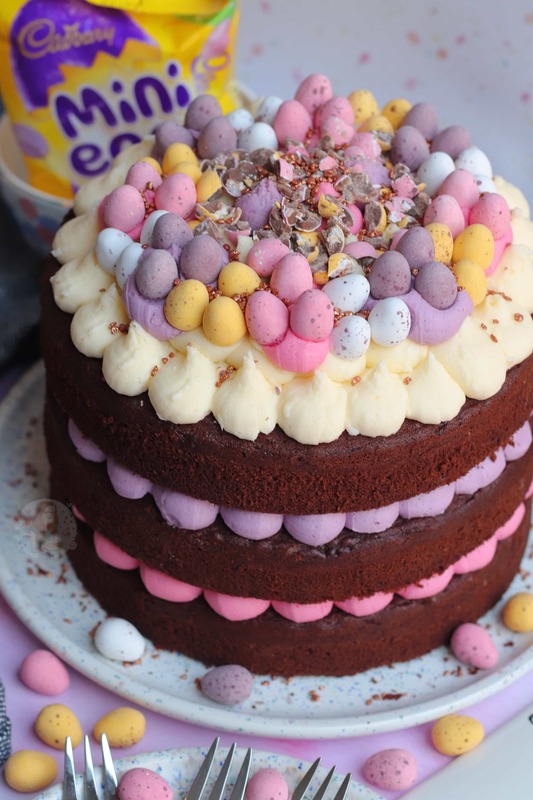 Last year I also posted my Easter Chocolate Fudge Cake, and I realise I have an issue with posting probably too many Chocolate themed Easter Cakes, but I just want to post more. 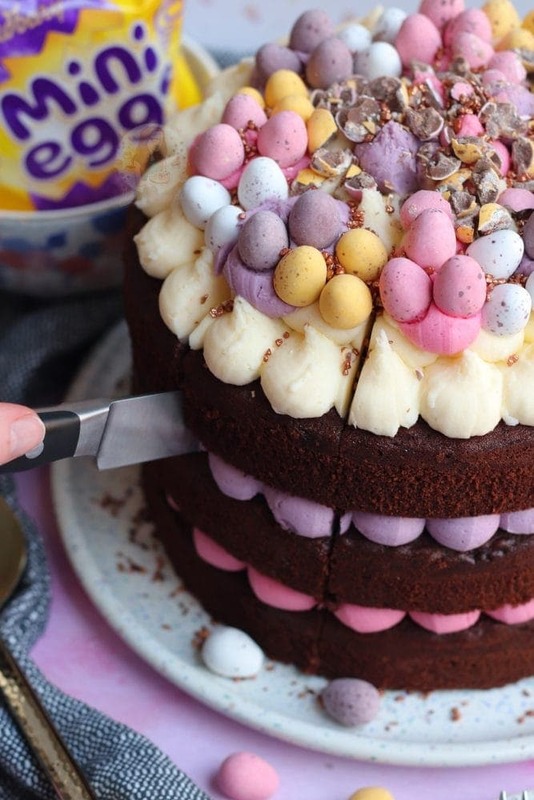 In 2016, I posted my Mini Egg Drip Cake, which has stayed as one of my all time favourites, because it has an Easter egg poking out of the top, and I don’t think you can really ever beat that to be fair. HOWEVER. I am all for this new recipe, because just look at it. It’s simple, its delicious, and it’s going to please EVERYONE. If however, you don’t like chocolate, then yeah you won’t be a massive fan of it. But, there are notes in the recipe on how to make it a vanilla cake instead of chocolate if you preferred! 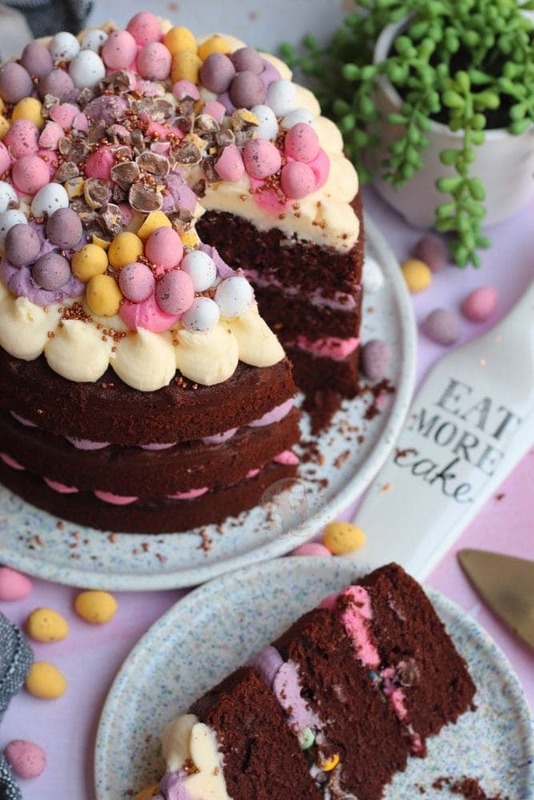 I realise that Easter can be quite chocolate heavy for some, so you might want to change it to vanilla cake instead. I use Rainbow Dust Progel Colours for this cake, as they are such good food colours. You really only need to use a tiny amount, and you get the perfect shade. I really ~desperately~ hate supermarket own liquid food colourings, as they just don’t have the pigmentation you need. Also, they can often make buttercreams split as you need to add so much. You can bake this into one sponge and split them if you prefer, I just prefer to keep it as three separate sponges to make my life easier. Also, I have a large capacity oven, so they all fit on the same shelf at the same time. If you wanted to bake one instead, you’d have to lower the baking temperature to 140C, and bake for longer! I do realise that this recipe basically means a lot more washing up that normal, as you will have three cake tins, multiple bowls, spoons and spatulas, but its all worth it. I tend to just chuck everything into my dishwasher and hope it gets everything off! This recipe is inspired by my Mini Egg Cupcakes that I posted the other day, and yeah you can see some crushed M&M eggs in there, but I’d ran out of Mini Eggs as I kept eating them… so my bad. 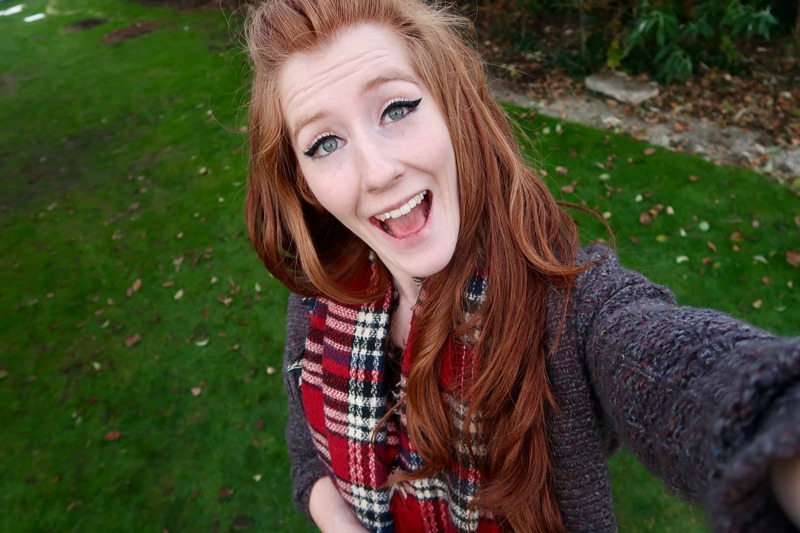 Shows how easily you can switch it all around! Preheat your oven to 180C/160C Fan, and line three 8"/20cm cake tins with parchment paper. Beat your Butter and Sugar together for a couple of minutes until light and fluffy! Add in your Flour, Cocoa Powder, Baking Powder and Eggs and beat again till a delicious cake mixture is formed. Split evenly between your cake tins, and bake in the oven for about 25-30 minutes. Can take less or more time, depending on your oven. Check the cakes are cooled with a skewer! Leave to cool in the tins for 10 minutes, and then transfer to a wire rack to cool fully. Make sure your butter is at room temperature, and beat on its own for about 5 minutes to really loosen it. Add in the Icing Sugar roughly 1/3 at a time, and beat fully. Add in your vanilla and beat till smooth - I will beat it for about 3-4 minutes to really fluff it up. Split the mixture evenly between three bowls - make one purple, one pink and leave the last as it is for yellow/white. Get your first sponge, and spread/pipe over your first colour. Sprinkle on some crushed mini eggs if you like! Get your second sponge and repeat till you have your top sponge! 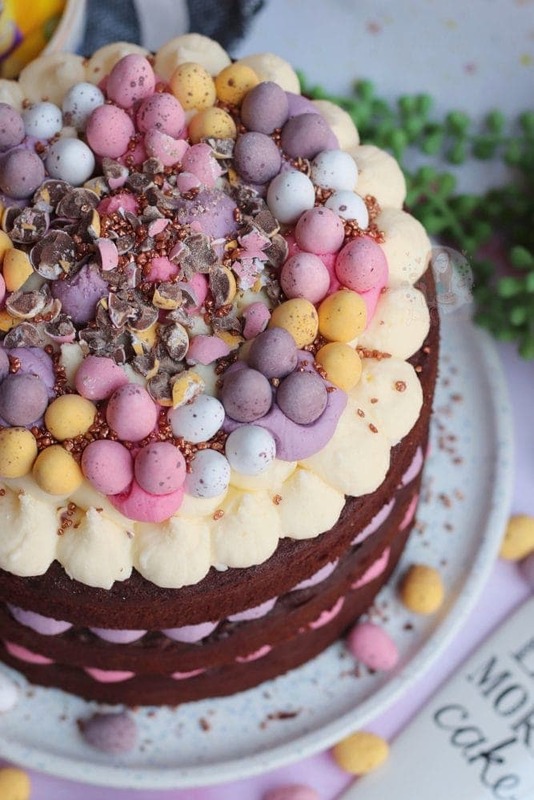 Add on your last colour, and decorate how you like - use any leftover buttercream, or whatever you fancy and add on as many Mini Eggs as you prefer with some cute sprinkles! I will always recommend Sugarflair colours or Rainbow Dust progel food colouring! I recommend using these large piping bags as they're perfect for the job! And if you want to pipe the blobs of buttercream on, you can use this amazing round piping nozzle! Supermarket wise, the Dr Oetker extra strong gels can work for this, you might just need quite a bit of it! This cake will last for 3-4 days at room temperature! 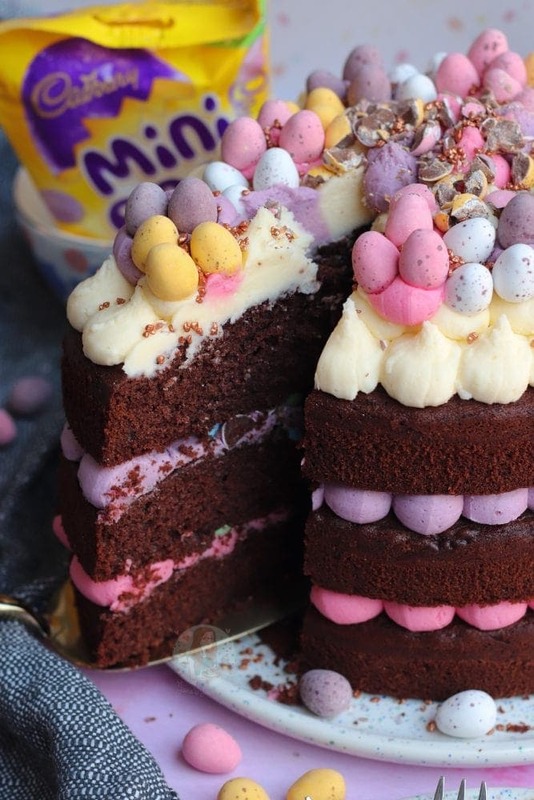 I used probably 300-400g of mini eggs in this, but you can use more or less as you please! If you want it to be not chocolate flavoured, take out the cocoa powder and replace with more self raising flour. 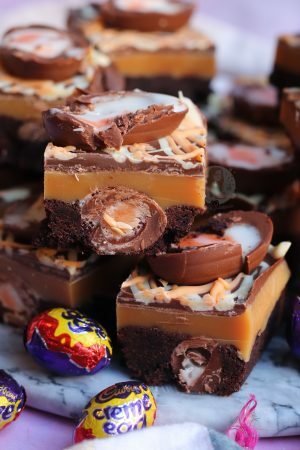 Older Next post: Creme Egg Millionaires Shortbread! 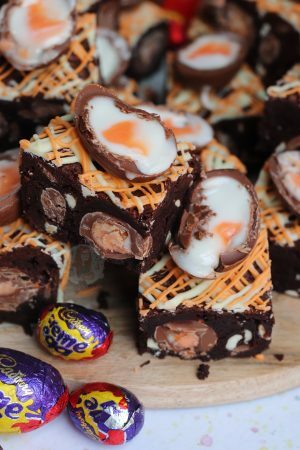 Newer Previous post: Creme Egg Brownies! I only have 9”/23cm tins, how much should I increase the quantities by? I believe by 1/3 more! Hi Jane this looks stunning and can’t wait to make it for my boyfriend for Easter! 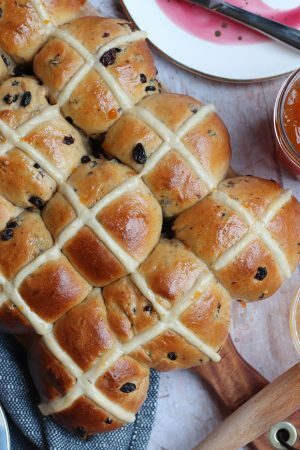 I made your Easter recipe last year too and it was such a hit with everyone!! In fact I only use your recipes now. Can I use plain flour for this? 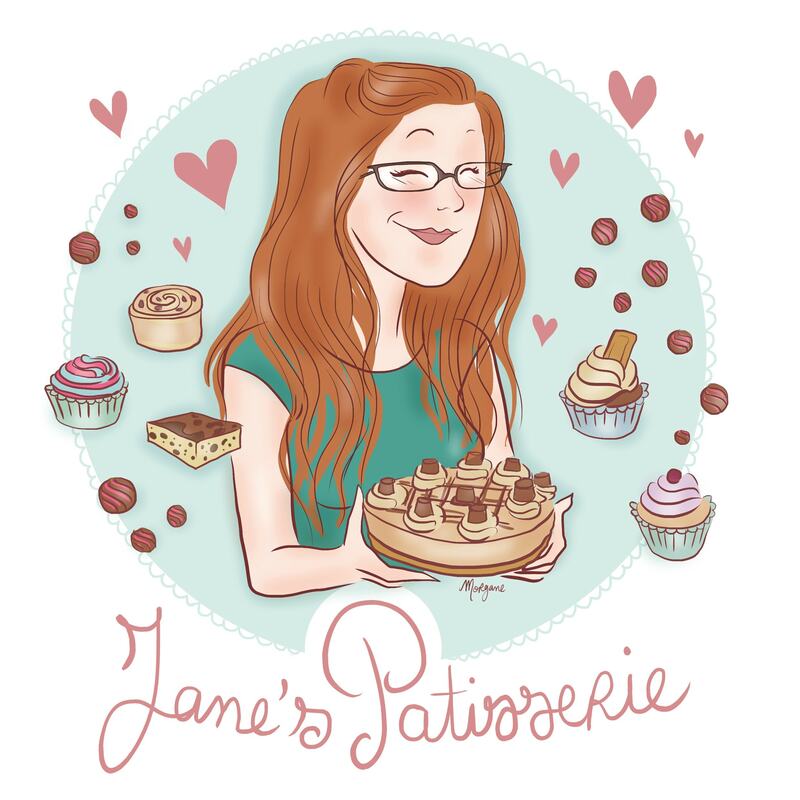 Do you have a general rule of thumb regarding how many tsp of baking powder for a 400g sponge cake if using plain flour or would it vary from recipe to recipe? What nozzle do you use for piping the buttercream on this cake please?